The ‘PRΩMEGA’ Daily Support pack is designed to help bridge any nutritional gaps in your daily diet with a one-month supply of two powerful daily nutrition products. A nutritious, balanced diet is important in order to maintain good health, but for many it is not always easy to achieve. Loking back over the last few decades it’s easy to see that our diets have changed considerably, and our busy, hectic, and stressful lifestyles, often lead us to eat for ‘convenience’ and not necessarily for ‘health’. Pea Protein Plus contains a vast array of healthful, nutrient-rich natural ingredients. Each serving provides 13g of vegetable protein in a comprehensive nutritional blend that offers generous amounts of a wide range of vitamins and minerals, nutrient-rich greens, fruits and herbs. This formula is sweetened with natural stevia, and only 110 calories per serving, Pea Protein Plus may also be used as a meal replacement. Free from dairy, lactose, fat and gluten, this superb blend is perfectly suitable for vegans. Mix two level scoops of Pea Protein Powder with approximately 8oz of water or milk, and shake vigorously. Pea Protein Plus is ideal for anyone wishing to increase their daily protein intake with an easily digestible, high quality vegetable protein. Use daily as a nutritious, filling snack, a boost at breakfast, a post workout shake, a mid morning top-up, or a satisfying meal replacement for those on the go. Pea Protein Plus is great anytime of day, and however you take your shake, it will be bursting with natural goodness! Super Omega-3 EPA. Essential fatty acids (EFA’s) are just that – essential to life! We cannot manufacture these within our body, so we have to rely on obtaining what we need from our diet. As well as providing the building blocks for cell membranes, Omega-3 EFA’s have been found to have multiple health benefits for the whole body. 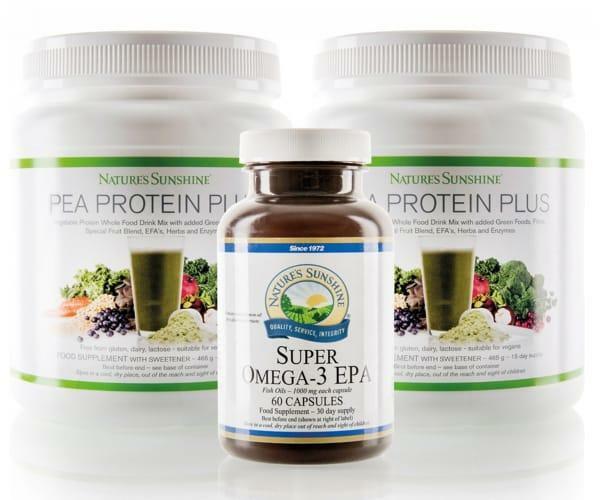 Each capsule of Nature’s Sunshine’s Super Omega-3 EPA is hermetically sealed during encapsulation, and two capsules provide 760mg EPA and 380mg DHA, with natural lemon oil for a pleasant taste. Take 2 capsules with a meal once a day. USE: Take as per instructions on individual product labels. Pea Protein Plus 465g tub. Super Omega-3 EPA 60 capsules per bottle.